Stilton is a kind of English cheese which is always distinguished for its good taste and smell. It is used as a major ingredient in a variety of salads prepared all over the world. One such salad is ‘Balsamic Stilton Salad’ which combines baby salad leaves, balsamic vinegar and walnuts apart from stilton. Balsamic Stilton Salad is well-known for its mouth-watering and delectable taste and also gives a cool and refreshing effect. Due to these fine qualities you can add this salad as a side dish in your meal and can also serve it in any occasion or get-together like a formal dinner, barbeque party, family union or national celebrations. You can also try out different variations in order to suit your own taste. Another important feature of Balsamic Stilton Salad is that it is much convenient to prepare at home and you can prepare it in just ten minutes and can serve it with described amount of ingredients up to two persons. Although you can increase the amount of ingredients while if you are making it to serve in parties and family gatherings. Utensils: Medium sized Bowl, Small bowl. 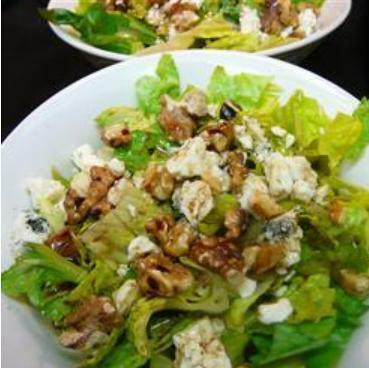 Take a medium sized bowl and combine blue cheese, baby salad leaves and walnuts in it, toss them. Set aside. Then bring a small bowl and beat together lemon juice, balsamic vinegar and olive oil in it. Now adjust dressing according to your taste. After that pour the mixture of lemon juice, balsamic vinegar and olive oil over salad mixture and toss it until all ingredients combine well. Now your desired Balsamic Stilton Salad is ready to be served.